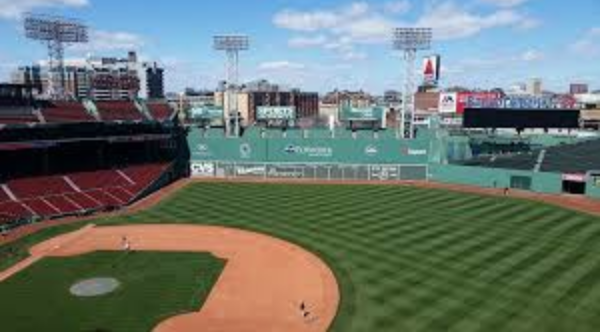 The oldest ballpark in Major League Baseball is soon to be filled with fans cheering the beloved Boston Red Sox. This year the Red Sox Home Opener is on April 9th versus the Toronto Blue Jays. The defending World Series Champions are expected to have an excited and energetic crowd greeting them at one of the most legendary and well known ballparks in all of Major League baseball. Whether it is the food, the fans, or the folklores, it is difficult for Fenway Park to disappoint an enthusiastic Red Sox fan. Junior Evan Gray says that he always looks forward to going to a Red Sox game and points out the magnificent views that Fenway offers. “Every single time that I go to a game I look forward to that overwhelming but amazing feeling of walking to your seats and seeing the entire ballpark before your eyes,” said Gray. Senior Amanda Brown says that the environment at Fenway Park was memorable. “I went to a game a while ago and the whole stadium was vibrant with laughter,” said Brown. Junior Andrew Burton agrees with Brown and says that Boston’s close community contributes to the sense of togetherness that he feels at Fenway Park. “Because Boston is such a tight community and the ballpark is so small, there is a big sense of community and togetherness,” said Burton. “Its like no other stadium that I have been to,” added Burton. The food at Fenway is yet another aspect that tends to stick with fans. Gray says that he always encounters the smells of the same foods when he goes to a ballgame. “ I can always smell the peanuts and crackerjacks,” said Gray. Brown says that she remembers the sweet treats that Fenway sells. “I absolutely loved the popsicles there,” said Brown. Burton says that he always goes to get pizza right outside the ballpark. “I love the Regina Pizzeria that is super close to Fenway,” said Burton. Despite the famous features of Fenway, there has been conversation about reconstructing the ballpark because of the out of date architecture. Gray says that there is only one part of Fenway that he would change. “I think the only thing that could be better is more availability to cooling stations especially because it gets really hot there in the summer,” said Gray. Burton disagrees with Gray and says that he would not change anything about Fenway Park. “The history behind Fenway Park is such a big part of the stadium so I would never want anything to change,” said Burton.